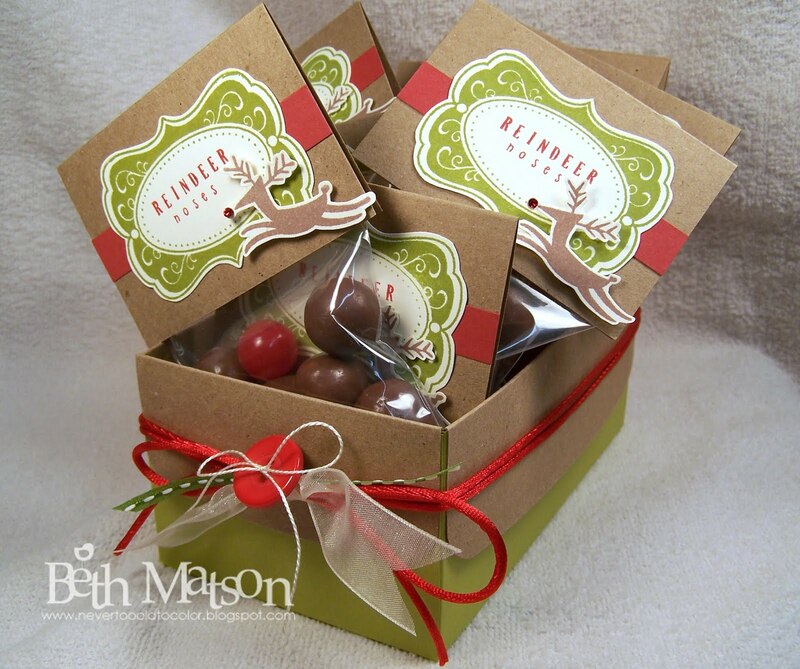 Are you looking for a cute little stocking stuffer or small gift for the kids in the neighborhood or classmates? 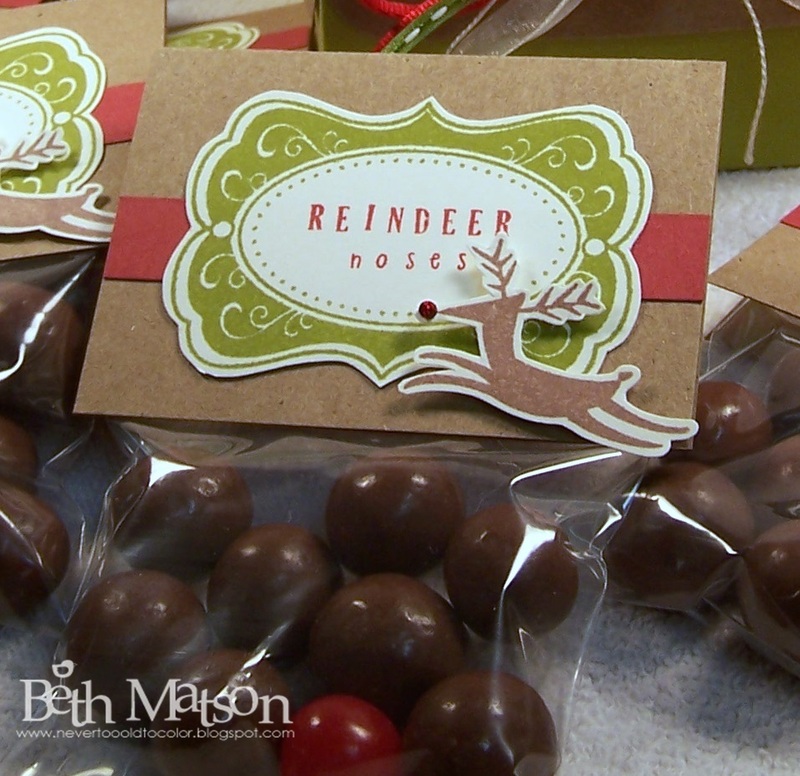 Well, how about some Reindeer Noses. A friend brought me a page torn out of her Current Catalog and asked me if I could make her some packets of Rudolf Noses. After more thought and discussion we decided on Reindeer noses instead of strickly Rudolf noses. Here's what I came up with. 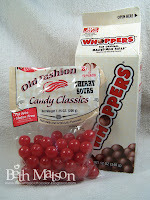 . .
8 whoppers per pack for Dasher, Dancer, Prancer, Vixen, Comet, Cupid, Donner and Blitzen. And 1 cherry sour for Rudolf. Thanks so much for stopping. I hope you're having a wonderful Wednesday! Please let me know if you make any packets of noses and leave me a link if you post them on-line. Are these adorable or what???!!! They would sell wonderfully at a bazaar! Oh my these are adorable Beth! So creative - love it! I love these!!!! What a great idea! I am going to use this for my husband's employees Christmas gift bags! Thanks for sharing...they are too cute! Gosh these are so sweet, you are so clever, I love this idea. This is adorable, love the bag toppers and the box they are is so cool! Super creative project! I may have to CASE this for my son's preschool class. TFS! Beth, these are just the CUTEST! You're gonna create some smiles for sure! Aren't you just the clever one? :) These are awesome!!! This is just adorable...so cute and too clever! Beth, what lovelies!!! These are so fun and looks quick for me. Maybe I can do some for M's teachers. Thanks for the inspiration!! Never too old to color? I love it! Love these little goody bags!! I see that you used Hero Arts stamps... Can you share what sets you used for this? I was lurking around the Hero site and wasn't able to come up with these. Oh Beth! These are sooooo adorable! What a great idea! 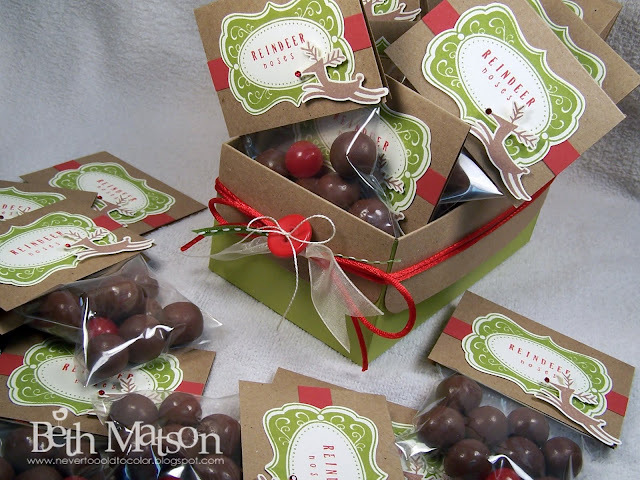 FANTASTIC SWEET creations! Love them...pure eye candy! this is such an adorable idea.... might have to case for my neice! Thanks for this great idea! Making these with my kiddos tomorrow! Cheers! I dooo like those - although I am not entirely sure what I'd use for red noses as I don't think that we have candy sours in the UK. Thank you, you're the first to explain what are those Reindeer Noses made of! I read 10 blogs at least! xD It doesn't exist here, in France, but I love the idea!